After my first go with the new AMD processor, I must say that Ryzen and the AM4 platform is really disruptive for the entire desktop PC market. The high-end Ryzen 7 processors launched last month and are already taking away sales from Core i7 processors. Their competitive prices and high performance structure has enabled users to build gaming desktops that not only perform on par with Intel’s best CPU offerings but also at a lower cost. AMD Ryzen 5 1600X – Is AMD’s Fastest Hexa Core Any Good? Now we have the Ryzen 5 processors. These processors are further bringing down costs and are based on the same Zen architecture that delivers a massive 52% IPC leap. With both 6 core and 4 core offerings available, these chips are aiming right at the mainstream Core i3, Core i5 and Core i7 desktop processors which have long been the favorite market segment for gaming PC builders. The processor I tested today, the $249 US 1600X offers unmatched price to performance value. In terms of pricing, the Ryzen 5 series aims the sub-$300 US segment which is a crucial market for hardware companies as it caters to the majority of mainstream audiences. Surprisingly, the Ryzen 5 series processors are priced really well in this segment. The Ryzen 5 1600X competes directly against Intel’s Core i5 7600K which retails at a similar price. Looking at performance numbers, multi-threading is a big leap and one that even puts Intel’s 6 core HEDT chips to shame. Looking at the prices, we see a difference of $200-$300 US and the X99 platform itself costs a lot more compared to AM4. When compared to the similarly priced i5 7600K, we see the Ryzen 5 in a league of its own. The Core i5 looks like a measly little chip that is being humiliated with double digit percentages on the Ryzen 5 1600X. When we switch to game performance, Ryzen 5 1600X shows a different face. While multi-threaded and single-threaded application performance is very good, but in gaming, the Ryzen 5 chip faces the same issues that were seen on the Ryzen 7 series. The gaming performance isn’t poor but it’s also not on par with the Core i5 chip that’s priced similarly. It’s one of the segments this chip was designed for as most buyers here will be looking for a chip that provides them good gaming experiences. 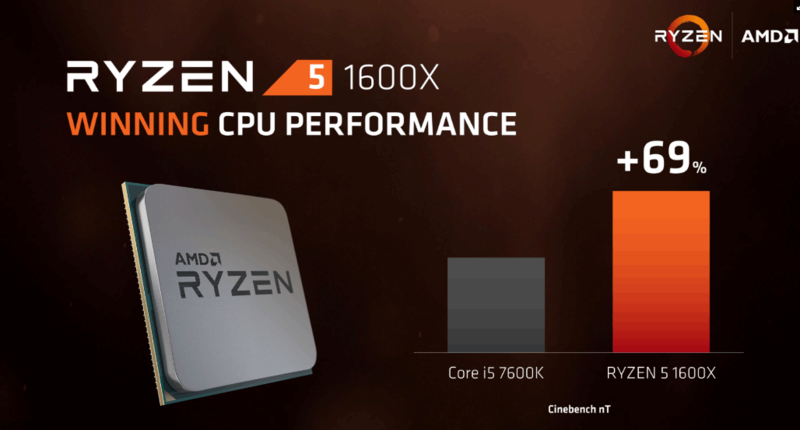 If we take a look from another perspective, Ryzen 5 can accommodate some hefty streaming workload so while it may not be the fastest gaming chip, it will offer gamers lots of muscle to stretch while streaming games to other audiences without lagging. 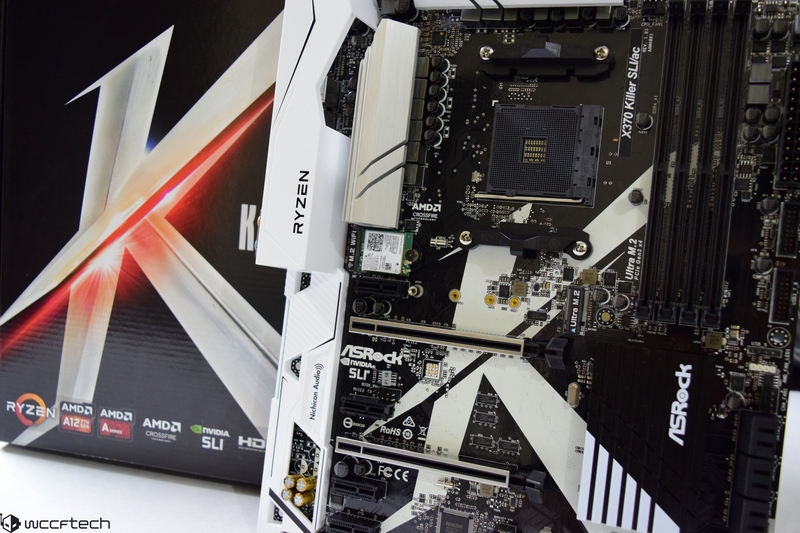 The ASRock Killer X370 SLI AC motherboard on the other hand is one outstanding X370 motherboard. With a price of just $144.99 US, this motherboard is a bang for buck winner. It comes with all the I/O that’s necessary for a gaming setup and adds nothing too fancy like most gaming motherboards from other manufacturers do. It helps bring the cost down and still offer a neat and impressive board style that will be loved by many. The white and black theme on the board looks great, it comes with CrossFire support, features multiple SATA, M.2 and USB 3.1 ports and can support all the way up to the flagship Ryzen 7 1800X processor. The motherboard offers decent overclocking support and has a bulky heatsink system deployed to keep the VRMs cool and stable under heavy load. Furthermore, the motherboard adds wireless capabilities under $150 US which is an absolutely killer deal. I would say that ASRock’s X370 Killer SLI is the board you have to aim for when building a Ryzen PC. It has everything to get you started in your gaming and multi-tasking endeavors. Overall, AMD has disrupted the market with a highly competitive CPU platform (Ryzen + AM4). Sales for Intel’s Core i7 and Core i5 are definitely affected by the launch of Ryzen 7 and Ryzen 5 aims to further disrupt Intel’s dominance in the sub-$250 US market range. The Ryzen 5 1600X and the ASRock X370 Killer SLI AC are two great products if you want to build a low cost, high-performance PC setup for multitasking and game streaming workloads. AMD has built a disruptive platform with Ryzen and AM4 with the new Ryzen 5 1600X plus ASRock X370 Killer SLI AC showcasing a powerful bond in multi-tasking applications and competitive gaming potential.